I can’t say how much I love when celebrity moms give little glimpses into their worlds as mothers. When I see someone as famous as Beyoncé or Serena Williams talk about mom life, it makes me feel like my little catastrophes are normal and defy the bounds of class and socioeconomic status. 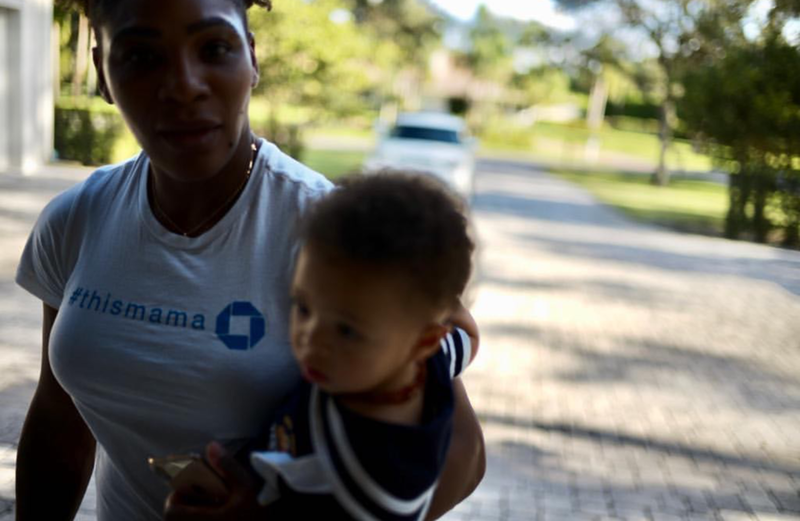 Serena Williams is the queen of letting her inner-mom hang out. She posted on Instagram Saturday a picture of her holding her daughter and admitted that the beautiful little girl’s mom is simply tired. Moms, including the one writing this, came out of the woodwork to offer tips, promote their products and offer encouraging words. They recommended tips from using water bottles and Post-It notes as toys to the ever-so-practical advice to take chewing gum or baby bottles to help the little ears pop. In two hours, Williams had more than 2,200 comments and 83,730 likes. Embrace the element of surprise on flights. “I used to take their favorite toys and books and wrap them one by one in the comics, so they were surprised when they opened each one,” @mmaria_flaherty said. She also wrapped snacks for her little ones to keep the surprises coming. @La_emperatriz said she has Costco’s brand of car seat, and it’s less than 10 pounds and airplane tested. She also purchased a Britax attachment with wheels that are easy to unhook when her family takes off. “It has been my saving grace for my kids to fall asleep more on planes,” she said. They have their space and are more comfortable. She can also easily hand then snacks and activities to keep them occupied. Embrace tape, toys and coloring on airplanes. Throw in a few crayons and a notebook and a roll of painter’s tape to provide some sticky fun that’s easy to cleanup, and you’re good to go. Design a flying bag with your little one. @the_italianbombshell said let your daughter pick out a few items while shopping with you. “Set a limit,” she said, “let’s say 10 items. Then let her design a flying bag. The idea is to only let her play with the bag and things in it when she’s on the plane. “Also it gives her something to be ‘in charge of,’ the mom said. And she would know. Her babies are now 15 and 27 years old. Get an ice cube in a cup on the plane. Samira Nasr, who also happens to be the executive fashion director for Vanity Fair, said it may seem like a lot of walking, but it kept the little one entertained and out of the devices. Make sleep your friend not your foe when traveling. “Keep her up as much before the flight and give her a nice bath before you leave,” @_islandgyal_876 said. “I use an essential oil blend which is almond oil with a few drops of lavender to massage prior to dressing. Bring a bottle of vetiver oil for sniffing and some headphones with soothing music, and she’ll be sleep and relaxed in no time, the mom said. Thanks for this article and the tips. It’s a challenge to travel with children and also a fun experience, however preparation is key. I will definitely use these tips with ly l/o on your next trip. This blog is inspired me, we always have difficulties when we travel to Mississippi and Florida for 5-6hrs trip with our daughter. 2hrs into the trip after she have napped, ate, entertain herself, her attention span is depleted. We are flying to Jamaica next year 2-4hr flight and I have no idea how she will react, since this will be her first time flying . It is great to get some fresh ideas on how to keep my daughter entertained and calm during our long trips. LaCoya aka I have no clue on how to calm my daughter during our long road trips? Yes we do all the coloring on flights! Also hit up the dollar store before! That’s a great idea to let your child choose items for his/her flying bag. That way, the child will anticipate going on a trip! My kids are travel pros. They’re pretty good with entertaining themselves with only a few small toys that they choose to bring with them. No electronics! I love hearing travel tips like this to keep baby smiling. It’s not an easy job, for sure, well I can imagine anyways. What an inspirational post, I love seeing how other Mamas survive. These are all great tips given and traveling with babies can be difficult. I’ve always booked flights around their nap time. I need a little peace of mind while traveling with them. That flying bag is a neat idea, I will keep that in mind for the next time we go on a trip. These tips are great not only for Serena but any parent who is struggling to find ways to engage their children when traveling. Travelling with a little one can be so stressful, especially for long haul flights or drives. I loved all those tips, especially the ones where you wrap snacks and other things. Little kids always love surprises. This comment show us Serena is a mom just like the rest of us. We all experience that struggle in our parenting life. It’s so nice to see the responses from giving Moms.